Kitsa and Lydia were among the very few women in my graduating class at Eastern Mennonite College who did not wear a prayer veiling atop their heads. Why? Because they were not Mennonite. Kitsa, always on the look-out for fun! And then Lydia . . . 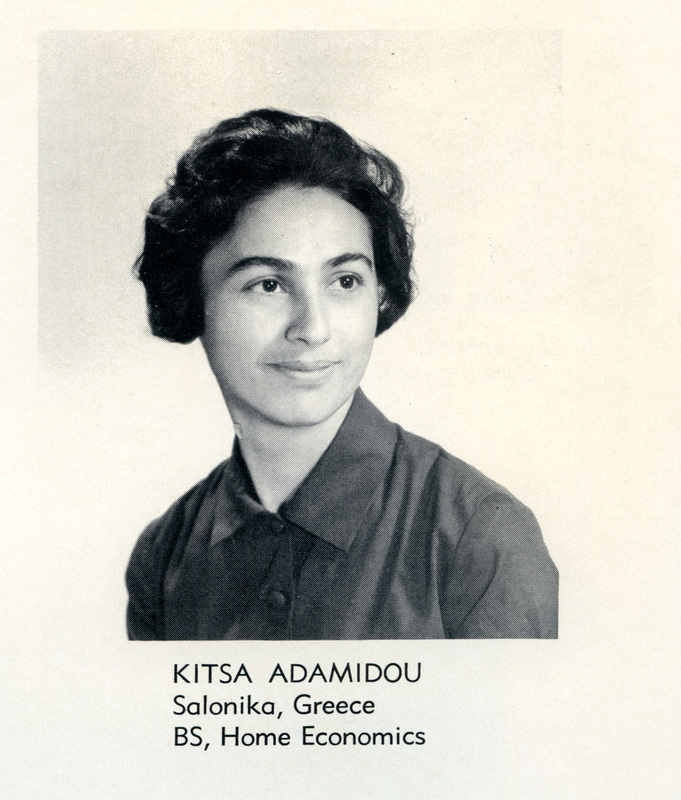 I was drawn to Kitsa and Lydia during my freshman year because I have always been curious about other cultures. In fact, one year Lydia was my roommate. It appears this inclination has run deep in my DNA. Now as I hold in my hand one of my Grandma Fannie Longenecker’s letters from college I can sense her keen interest in my “foreign” friends and a deep longing to know them better. Dear Marian – Guess you’ll be surprised to hear from me, I sure wanted to write before, just didn’t get at it – (Reason) older and slower . . . . Ruth was looking for a letter from you so be sure and bring Lydia & Kitsa along home over Christmas, and forget all about paint etc, two of you can stay here & we’ll have a good time that’s the thing that really matters, I think I’ll be Kitsa’s Grandma of America – Do you know what she needs or wants for Christmas? Forgot to say I’ll pay her way up & we really want them to come, so make it strong, times soon here! Be sure and get arrangements to come home early & if possible bring the girls along. I’ll pay Kitsa’s fare on arrival & find out what she would like for Christmas. This $ 5.00 spot is for you, maybe you need a little for odds and ends or transportation home. Tell us what you are hungry for, that you don’t get at school. Mark tells me ‘Marian will soon come home’ and his face lights up, so we are all looking forward to that day. Hope your old toe is better. Grandma’s interest in Kitsa persisted through most of my college years. 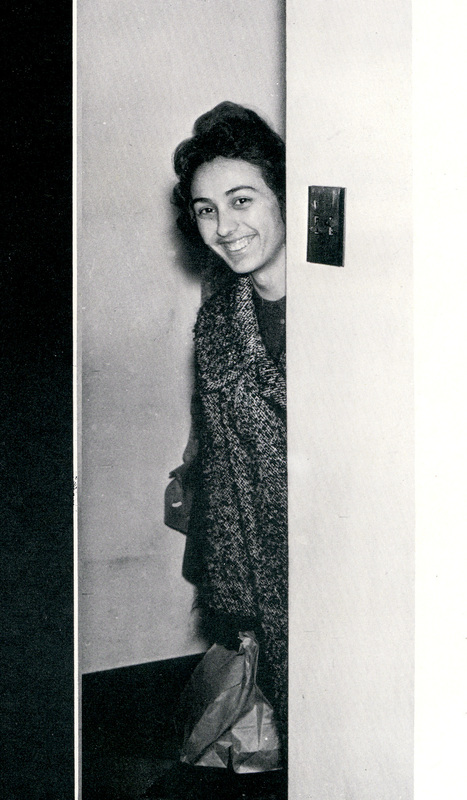 In her letter of March 8, 1962, she referred to Kitsa and her roommate pictured on the front page of Christian Living magazine (February 1962). For over 25 years, my Grandma and Aunt Ruthie practiced peace and goodwill toward all, as they opened their home to refugee and immigrant families, beginning with Phuong (pictured below), a young woman who arrived by boat from Vietnam. Their home was a warm cushion absorbing the cultural shock of leaving home and family; it was a safe haven, welcoming refugees from a colláge of countries including Bosnia, Croatia, Serbia, Russia—anywhere there was political upheaval. In a noisy world where some speak of building tall walls and wish to spread terror and violence, I am thankful for my heritage including an education at an institution, now Eastern Mennonite University, where the language of peace is preached and modeled. In fact, it is now possible to earn both under-graduate and graduate degrees in justice and peace-building at the University. Regrettably, the contact information I have currently for both Kitsa and Lydia has not yielded any results, so I don’t know what paths their lives have taken. But I do know that their lives, like mine, have been imprinted with the power of peace, a message this world could stand a good dose of in these troubled times. Just this morning, December 11, 2015, I had a long phone conversation with Kitsa, her smooth, alto voice music to my ears. She now lives with her husband in North Carolina and is very active at St. Nicholas Greek Orthodox Church where she is head of the Hellenic Culture initiative. She also gives private Greek language lessons. How have international friendships affected your life? Have you connected with long-lost friends recently? Marian, I love this post so much with its message of long ago friendship and peace among all people. Thanks for the excerpt from your grandmother\’s letter. I don\’t know what her voice sounded like, but I heard a voice in my head with the \”Pennsylvania Dutch\” inflection that I\’ve heard. To me, it\’s her kindness and generosity of soul that radiates out from that note, more than her curiosity about the women. In this time of hate-filled rhetoric, it is wonderful to know that there are those who espouse peace and goodwill to all. I hope you are able to reconnect with Lydia and Kitsa! A family member of mine just discovered relatives of hers that she did not know existed, so it\’s possible! My sister Jean has referred to our Grandma Longenecker as St. Grandma. But, trust me, if a halo ever had appeared above her head, she\’s surely brush it off! She used some Pennsylvania Dutch expressions, but she did not have a noticeable \”Dutchy\” accent. She was from originally from Dauphin County, not Lancaster; perhaps that made some difference. I\’d love to re-connect with Lydia and/or Kitsa. Thank you for the re-assurance that it\’s possible – and for showing up here, always an early bird! I haven\’t contacted any long lost friends Marian but I\’m lucky that each new day brings me a friend from somewhere abroad . New understanding, new friendship and new learning. I\’m very lucky. You are very lucky, as you say, because you reach out with your blog connections – and with your books! Other readers and writers detect your generous heart and respond accordingly. Huge hugs back to you, David. I echo the words of those who have already commented, Marian. Your grandmother sure was a special lady, and I am sure you have inherited those peace and love genes. I love reading your stories of your younger days and of your family. May peace be with you and your family this Christmas. Your smiling face here means that we are hearing from another hemisphere, another continent, Australia. I believe you too are writing about your family history in both poetry and prose. Brava to you for that, and thank you for stopping by to comment. Peace to you and your family also! It\’s possible that EMU is the only university that offers such degrees. Maybe another commenter can elaborate on that. I recognize more and more that the pen is mightier than the sword. Let\’s hope it will always remain so. 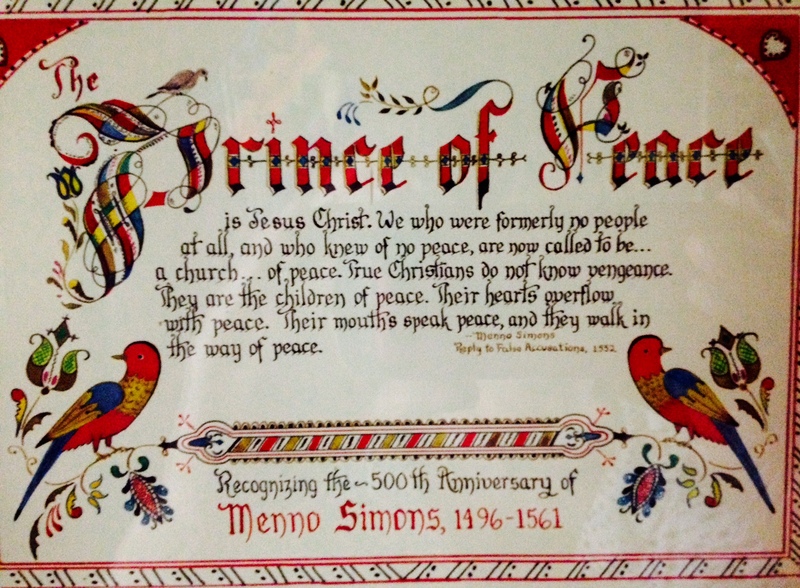 Most Mennonite and some Church of the Brethren and Quaker colleges and universities offer degrees in peacebuilding of some kind. EMU\’s CJP is the most renowned graduate program. You would know, Shirley. Thanks for passing on this information. These departments shed light like candles in a dark, dark world. I\’m happy to know that our institution heads the list. I\’m glad you found many points of harmony here today. Thank you, Anita. Wonderful post…especially for this season and in these times. You\’re welcome, Mimi. I often see you chiming in with our mutual colleagues on Facebook. How nice it would be to get together sometime. Remember cooperative learning and one of the 5 tenets: \”Face to Face Interaction.\” Those Johnsons were really on to something. Marian — I love that you come from a long line of people who LIVE peace and goodwill day in and day out, not just as a seasonal sentiment. Further, I delightfully floored to know that it\’s now possible to earn both under-graduate and graduate degrees in justice and peace-building. Who knew?! I enjoyed launching my day with this positive and uplifting post. Thank you! Selfishness was one character trait Grandma would never tolerate. The only time I ever heard her criticize someone was for that . . . mentioned it once, and never again. We took the hint! I imagine the link to justice and peace-building is getting a workout today. I hope so!. Thanks for the comment and the \”share,\” Laurie! What a great post.It amazes me how you\’ve kept so many things from your childhood and college. It\’s always nice to catch up with old friends. One day my daughter got a message on Facebook asking her if her mother\’s name was Gloria if so please call me, and left her number. Shanti called me to ask me what to do. I said call to see if it\’s a friend or a foe. We laughed. I never knew. Remember I was a bully as a teenager. Shanti called back crying to tell me it was a friend named Mildred who had been looking for me to thank me for helping her when she was homeless with her baby, and she was crying to finally find me. I called her and we\’ve been communicating ever since. Life and God is good. Hope you find your friends. You always tell it like it is, Gloria. I can\’t think of a more heart-warming story than Mildred\’s to share, especially during this season of the year. Bless your heart! How wonderful that your grandmother took such an interest in your foreign friends! My grandmother was the same. It is also what I love so much about the Mennonites. If only the entire world would embrace each others uniqueness and learn from each other. It is obvious your family has passed this sense of inclusiveness on to you. You have a similar heritage, Darlene: Look at you now – an author whose main character treks the world in search of adventure and meaning. Then you and your husband migrating from Canada to Spain ever widening your world view. Kudos to you too! Wonderful post Marian, and thank you for the message much needed these days. You\’re welcome, Ann. When I saw your smiling face and read your comment, I had to think of the name of your priest, also named Longenecker, I believe. Yes it is Fr. Dwight Longenecker. Wonderful post, Marian. When I was doing my undergraduate work (Brethren College) we had two women on our dorm floor from Viet Nam, one from India, and two from Indian reservations. Our floor was a caring, interactive blend of personalities…and great discussions. Once again today, I am struck by the similarities in our upbringing: Anabaptist world view and a college with sincere interest in international students. I\’m guessing you could write a similar blog post. Actually, maybe you already have – I haven\’t \”known\” you that long online. I always look forward to your take on topics here. Thank you, Marylin. Lovely story Marian . The more I get to know your incredible family , the more I wish I\’d met them …amazing . I have a customer that I had when I was sixteen and training in hairdressing . When I left to open my on shop she followed me . She had little money and worked really hard for her family …she suffered from stress related illness …so did I …and there was always and understanding between us …we used to dream together. One day her dream came true. Her husband got a job in Devon, and they all moved by the sea. Thirty years later I\’ve managed my dream to live in Wales by the sea. Ann and myself are still in touch after all those years . It\’s been many years since we have seen each, so we must arrange to meet up . I reckon we will still be dreaming even now. Follow every rainbow / Till you find your dream. I\’m happy you and your friend have each found a dream come true, Cherry! Sweet memories and shots and such a lovely story. I am so happy we can exchange words and photos, you pure poetry and me, prose. 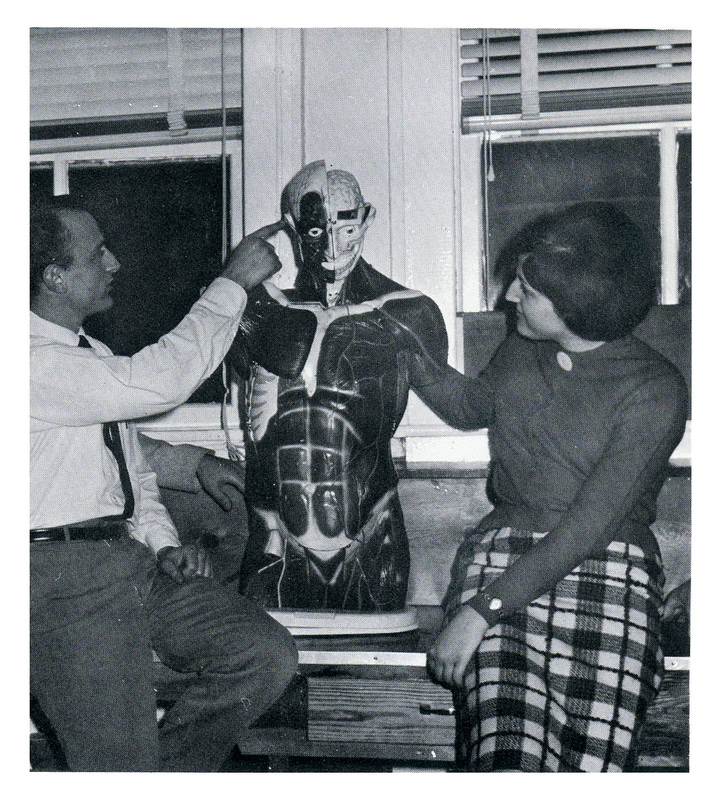 Those early days of \”international students\” at EMC/EMU certainly led us all in a direction which helped us meet and know the \”other\” as current President Loren Swartzentruber has talked about recently in regard to terrorism and inter-religious and international relations. My parents spent years hosting a variety of international visitors which I intend to write about sometime too! Regarding connecting after we\’ve lost contact, I\’m thrilled to have recently connected with a high school friend from Florida. She\’s an active Facebooker, so it feels like another piece of my life has been connected again. I would LOVE to track down my Spanish roommates from Barcelona (so far no luck). Thanks for this fascinating throwback. We introduced our teen-age children to international students through Mennonite Your Way, a great way to connect with the \”other,\” as you say. It seems you would have a good excuse to travel to Barcelona as your renewed connection to your high school friend would warrant. Thanks you for always adding spice to the conversation here, Melodie. Have you ever read the book Common Fire, Marian? It describes the powerful effect on children when their families show kindness to strangers, especially strangers from another culture. I love the pictures here, all of them. And I see the connections all the way back in time. Gives me hope for the future, too. Maybe EMU can help you find your international friends. In any case, I\’ll send this post along to them. 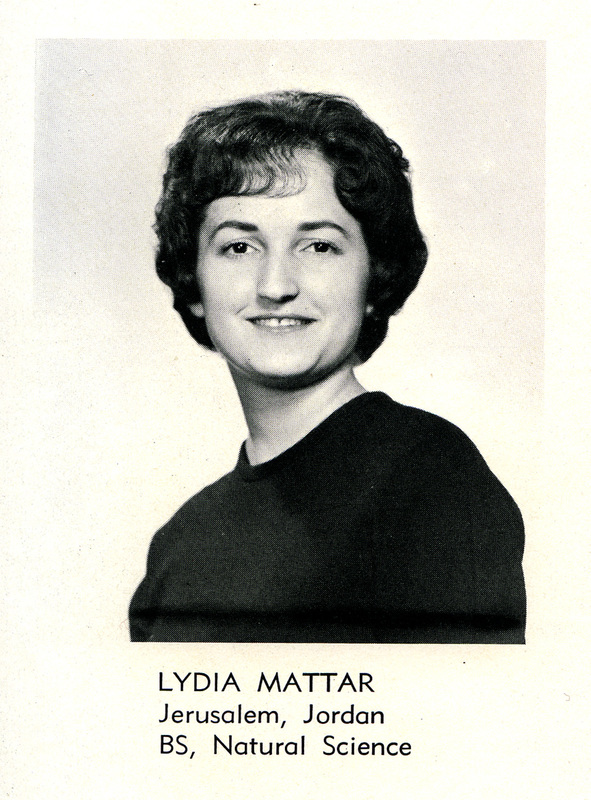 I was on the committee chaired by Lee Yoder to help gather letters for our 50-year reunion, but no one was able to connect with Lydia then. I probably need to check with the alumni association in case there is updated information for her now. Thank you for keeping your finger on the pulse, Shirley. What an ambassador for peace you are! And thank you for the book reference too. I saw your comment on Shirley\’s blog that you talked to Kitsa, and then went back here to see your postscript. How wonderful for both of you to be able to talk after all these years! I\’m on Cloud 9. She sounded just the same after all these years. Thanks for noticing and commenting here once again, Merril. We are all more alike than we are different. It seems many people are blind to that fact. Thanks for your being one more voice of confirmation here, Debby! Wonderful post! It makes me think of the many people whose paths once crossed mine–but who I have no idea where they are now. Like me, you obviously have found faces, long gone from view turn up in unexpected places. I have poked into your website and have enjoyed the variety, especially the table-scapes which give me ideas about how to jazz up mine and be more bold! Thank you for visiting here today. Please stop by again, Sheryl. I think your job as tour operator comes with binoculars for your blog. What a happy combination for a writer like you. Maybe we bloggers can have a Skype session one day. Thanks for showing up here often, Marie. Central New York, where I grew up, was culturally diverse. I went to high school in an area where many first-generation Polish immigrants lived. In Syracuse, I lived in areas that were predominantly Italian-American (as were my godparents), German, Irish, Vietnamese, etc. I was friends with those from many cultures. I really enjoyed learning about their interests, sharing their food and music. Their friendship fueled my interest in traveling abroad and working with immigrants who are learning the English language. Your posts reflect diverse interests and inclusiveness too. As I read your last sentence, I wonder whether you have taught English as a Second Language courses. How fortunate such students have the advantage of your creativity and care. I remember second-language students on the college level having lots of difficulty with subject-verb agreement and use of definite and indefinite articles. How well I know it! I just now had a chance to read and certainly enjoyed. You had a very interesting life. I love to read your blogs. You know, Pat, my life seemed kind of boring as I was living it, but the older I get the more I see the charm and security the boundaries of my Mennonite life provided. Thank you for noticing.